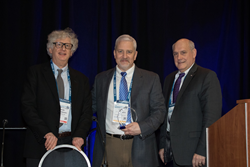 SAE International honored Stephen Spata, Technical Assistance Director for National Truck Equipment Association (NTEA), with the SAE/InterRegs Standards and Regulations Award, during the 2018 SAE Government/Industry Meeting in Washington, D.C. Established in 2000, this award recognizes a practicing engineer who has provided significant contributions to standards, regulations or conformity assessment systems for improved safety or reduced emissions in a ground vehicle mobility product. The individual can work on the standards/regulation language and/or on product to comply with the standards/regulation. Spata has served as an engineer in the automotive industry since 1990, having worked for Ford Motor Co and two Tier 1 automotive suppliers before joining the NTEA. Since 1994, he has worked more specifically with industry and government to further the safety and quality of many different forms of commercial vehicles. Most recently, he has represented the NTEA as a partner in a comprehensive research program with several Federal Agencies to improve ambulance crash safety and is a member of several different ambulance standards development committees. Through his Association work, Spata manages and serves as Secretary to several industry groups of specialized vehicle and equipment manufactures within the NTEA and liaisons to related organizations to represent these groups and further the interests of their membership, including SAE, NFPA and TMC. He also authored many articles and developed tools and publications to assist the NTEA’s membership with compliance of the vehicles and equipment they produce to the regulations of the NHTSA, FMCSA, OSHA and other Federal agencies. Spata earned his bachelor’s degree in mechanical engineering from Lawrence Technological University. To learn more about the SAE/InterRegs Standards and Regulations Award, as well as other awards available from SAE International, visit https://www.sae.org/participate/awards. SAE International is a global association committed to being the ultimate knowledge source for the engineering profession. By uniting over 127,000 engineers and technical experts, we drive knowledge and expertise across a broad spectrum of industries. We act on two priorities: encouraging a lifetime of learning for mobility engineering professionals and setting the standards for industry engineering. We strive for a better world through the work of our charitable arm, the SAE Foundation, including programs like A World in Motion® and the Collegiate Design Series™.